NuCalgon has discontinued this connector. 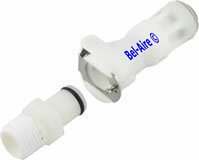 The connector was manufacturered by Colder Products Inc. We now offer the Colder Products connectors. For a replacement, see the PLCD Series. Two female quick-connect couplings and two male plugs. Allows for a quick filter swap with no tools. The male end is 1/4" npt and screws in to the NuCalgon filter. The female end has a push-in connection for 1/4" plastic or copper tubing. The female end also has a valve that prevents water from leaking when disconnected. With these fittings an in-line filter can be easily removed without water spillage and brought to a bench where the fittings can be moved to a new filter. Then the new filter assembly can be easily snapped in even at a difficult location. These quick disconnects allow the humidifier to be easily removed for cleaning. Highly recommended for humidor humidifiers that need more frequent maintenance. Also in the event of a failure, a mission critical humidifier can be swapped with a new backup and require no tools, minimal down time and no water spillage. Max temp 100°F.